Even though I had long wanted to visit Macao, I didn’t know that much about the region other than the basics. Like most people, those basics revolved around one thing – casinos. I knew that Macao was world famous as being a sort of Las Vegas in Asia and, if that’s what you want, you’ll find gaming tables that seem to go on without end. Thankfully though, during my brief stay there a few months ago I was able to get away from the glitz and glamor of the luxury establishments and discover a different side to Macao, a much older and I think much more interesting aspect of this very unique city. My trip was in cooperation with Cathay Pacific but, as always, all thoughts and opinions are entirely my own. The history of Macao really started with the Portuguese, who established a permanent settlement there in the 1550s. Their interest in Macao was based mainly on the strategic location for shipping and trade and over the course of more than 400-years, the colony largely prospered and was a successful overseas possession for Portugal. Transfer back to China occurred in 1999 and marked the end of a very long relationship that defined Macao in every way. In fact, it was this European legacy that surprised me the most during my stay. Macao is also incredibly easy to reach. Arriving into Hong Kong International Airport the steps could not be simpler to quickly connect to Macao. As soon as you deplane, DO NOT go through immigration or get your bags. 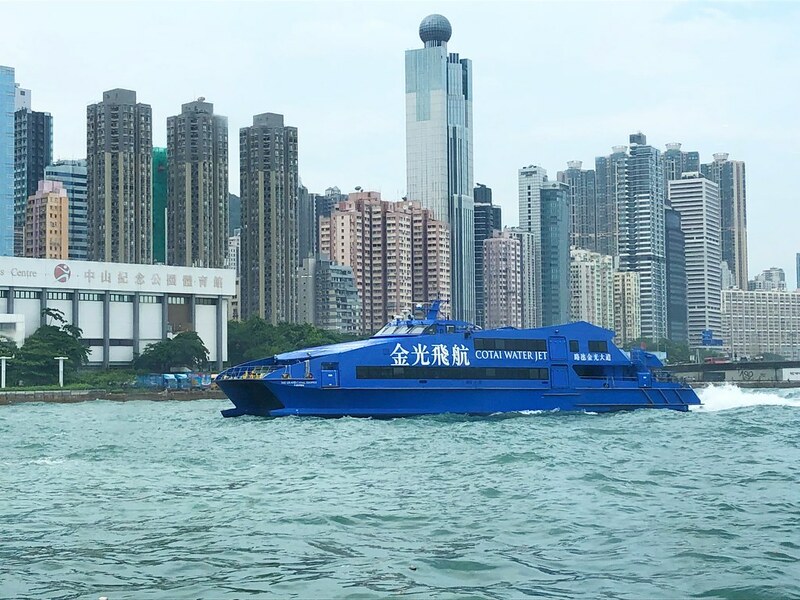 Instead, head to the Cotai Water Jet ferry counter, purchase your tickets for the 1-hour boat ride and let them do the rest. They take your bag tags, collect your things and transfer them over to Macao for you. It’s a seamless process and there’s nothing that the connecting passenger has to do except wait for the next ferry. The boats themselves are large and comfortable with plush chairs and great views. The trip is short and as soon as I arrived I collected my things and was on my way. The process is just as easy for the return. If you’re going back to Hong Kong International Airport, you can check in your bags at the ferry terminal without having to worry about anything. When I checked in for my return, the bags were tagged to my final destination and that was it. I really have to applaud the powers that be in Hong Kong and Macao for making this process as easy as it is, enabling more people to visit and to enjoy their time in beautiful Macao. I love history and I especially love visiting new-to-me UNESCO World Heritage Sites, which is probably why I enjoyed my time exploring the historic center of Macao so very much. The entire old town is designated as a UNESCO site for a variety of reasons. The long legacy of Portuguese control has thankfully been preserved throughout the centuries, presenting visitors with a city that feels more like Europe than Asia. Macao was also a strategically important city for a very long time and a center of trade between Europe and Asia. This history and the traditions that accompany it are thankfully all very much alive in Macao, and easy for the casual visitor to experience. What is essential for any visitor to Macao is to leave the casinos and head down to the historic center of the city, starting with the ruins of the now famous St. Paul’s church. Originally built in the 1600s, fire destroyed the large church more than once and it was after the final inferno in the 19th century that it was finally abandoned. Later restored, the facade is all that remains, but it has quickly become a symbol of the city. It’s also the ideal place from which to start to experience the expansive history of Macao. Blue Portuguese tiles and expansive squares were the theme of the day as I dodged rain showers and tried to visit as many of the more than 20-historic spots as I could. Together they tell a story of a colonial era that doesn’t seem as onerous as in some places I’ve been. It seems to have been a more laid back sort of occupation; trade and money being the focus of Portugal’s interest in the region. However history decides to remember it, what is clear is that the Portuguese have forever left their imprint on this remote city in the Far East, and in the 21st century that is perhaps best seen in the city’s dynamic food scene. Since Macao has been at the confluence of international trade in Asia for centuries, the food scene reflects those influences. You can and will find everything in Macao, from very traditional Chinese cuisine to those famous Portuguese egg tarts that have become the stuff of legend. What was perhaps the most interesting to me though was experiencing a style of food found only in the city, Macanese cuisine. Like all great food styles, it has very humble beginnings; dishes created by local workers from what they could find. It’s also the cuisine that best exemplifies Macao, a strange but tasty combination of foods and traditions. Based on Portuguese cuisine, these spices and ingredients from Africa, Southeast Asia and India – including curry, coconut milk, cloves and cinnamon – are combined using Chinese culinary skills in a wonderful potpourri of tastes and aromas, giving birth to the uniquely delicious Macanese cuisine of today. African chicken is perhaps the most famous dish, but my favorite was a hash of sorts called Minchi. Originally made by using what was around the kitchen, it’s a combination of meat, potatoes, spices, rice and egg and was usually cooked by parents looking to feed their large families. It’s been embraced again though by traditional restaurants in the city and for me, is the star of Macanese cuisine. UNESCO has even recognized Macao for its very unique culinary history and to enjoy it in person is just one of those experiences everyone has to try at least once. If you haven’t visited Macao and think you know what to expect, you’re probably wrong. I know that I was. Macao is one of those places that you will find what you look for. If you want to spend a few days staying in a luxury hotel, eating great food and handing over large quantities of cash to a casino, you can do that. But if you want to discover a fascinating destination with a long history and colorful culture, you’ll find that too. Macao is what you make it and for me, I know it’s a place that I’ll return to again and again, to continue exploring and expanding my own education into this fascinating part of the world. Macao looks like a very interesting city. Thank you for all the great information.